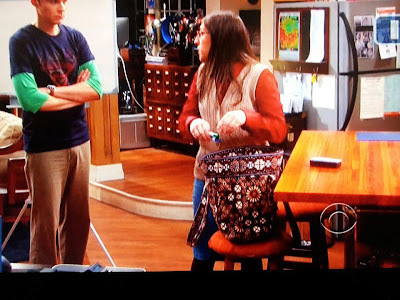 Thanks to the OhMyVera readers who pointed out and sent in photos of Amy carrying a Vera tote in Canyon on a recent episode of Big Band Theory! I posted this on Facebook last week, but didn't get a chance to post it on the blog yet, so some of you might have already seen this. It is always fun to spot Vera Bradley on TV! If you ever have a Vera Sighting from TV you can email it to me at ohmyvera@gmail.com and I will get it posted for everyone to see.